Happy inauguration eve everyone! I know that I should be posting a bunch of red, white and blue decor and singing my heart out in celebration of the last day of eight very, very long years. But, first things first, today is my friend Ben's birthday and we need to give him a shout out before tossing our baton and taking our first inaugural day parade steps. Our birthday boy is a sound guy, as in, holding boom mikes and recording voice overs. All of his equipment is pretty ugly (save one speaker case that I stickered for him) and consists of a bunch of techy boy stuff and wires. I think if Ben really wants to look pro, he should probably give his own personal sound system a boost with any of today's speaker choices. This universal plug and play system for audio devices was designed by Per Brickstad as his design degree project. I don't know about you kids but when I was in art school I was surrounded by a bunch of stoners chopping up shopping carts. I think I might have gone to the wrong school. Anyway, I hope Brickstad makes these quick, when he does, for Ben's birthday, I will suggest to him that he buys one. What? Typing this isn't enough? 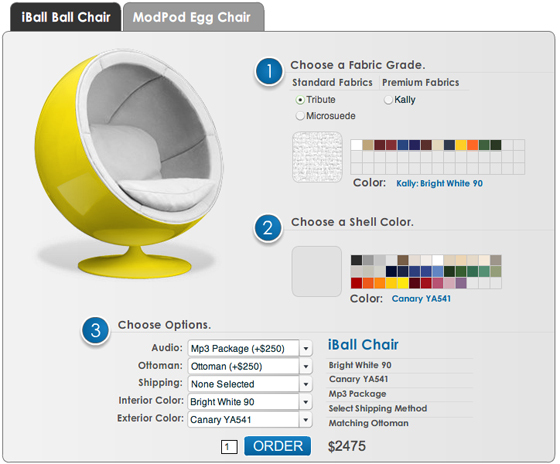 If Ben's grandma sends him a check for $2475 for the big 3-7, he could have an MP3 playing iball chair made to his specifications. Hunter green shell with mint interior? Whatever you say, birthday face. If Ben wants to lay down some bass, he could compliment any of the above sound systems with these precious woofers. The next time our birthday boy has a few days off between shoots and is feeling crafty, he could even follow this DIY guide for making his own Munny Doll Speakers. He will easily be the coolest man on campus if he marches back to set toting these gems. These custom illustrated speakers by Get The Egg would be a lovely addition to any bachelor pad and shouldn't scare the ladies off at all. This Concerto Table is sure to woo any young lady Ben decides to invite a lady in to "see his record collection" or "meet his new cat"
See Ben, aren't you just so glad we're friends? What on earth would you do without all of my wonderful advice?